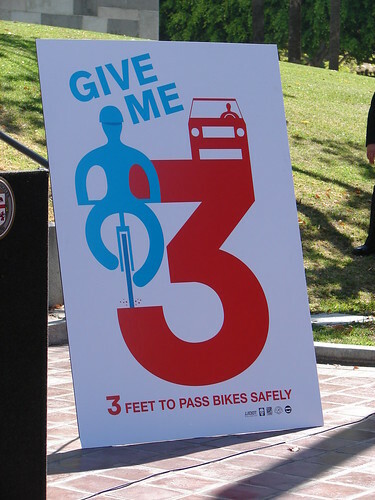 The LADOT Bike Blog is happy to report that the State Senate has recently passed the “Give Me 3” Bill (SB 910) by a 27-9 vote. (Review our last post on the “Give Me 3” campaign.) Now the bill will move over to the State Assembly for further consideration. For California to join the 18 other states that already have similar three feet passing laws, we must let our elected officials know that this issue is near and dear to us all. Be sure to contact your local assembly person and show your support for the three-foot passing bill! Give Me 3 has now made it through the State Senate! 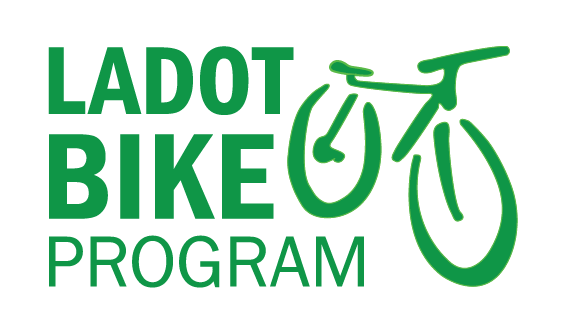 require drivers of a motor vehicle passing a bicycle proceeding in the same direction to pass on the left and provide a minimum clearance of three feet or drive at a speed not exceeding 15 mph faster than the speed of the bicycle. establishes a $35 fine for failure to provide the minimum three-feet clearance or passing at a speed exceeding 15 mph faster than the speed of the bicycle. The fine climbs to $220 if a collision occurs and the bicyclist is injured and the motor vehicle is found to have not complied with the 3 foot passing law. allows the driver of a motor vehicle to drive on the left side of double yellow lines if driving on a substandard width lane and passing a person riding on a bicycle or operating a pedicab in the same direction. substandard width lane is defined as a lane that cannot safely accomodate a bicyclist and a motor vehicle. We’ll be sure to keep you up to date with this bill as it proceeds through the legislative process. Minor quibble: on one-way streets cyclists may ride near the left curb as well as the right. Language specifying that a motorist may not pass a cyclist on the right (unless the cyclist is in a left-turn lane) might be appropriate. I haven’t read the bill’s language itself, so perhaps this is already covered. But in any case there are numerous one-way streets in LA and SF where road ragers could get off on a technicality if this is not noted. I guess it should specify “between the cyclist and the curb,” in my second sentence, as I realize on re-reading my previous post. Thats a great point Rick. I’ll read through the bill to see if that point is addressed. If it isnt, it should definitely be addressed in the Assembly! Here is a link to the senate floor analysis. This is about making it safer to ride a bicycle in CA…but, more inmportantly, it’s about saving lives. Don’t get detoured by those who think cyclists are already protected and that the lack of enforceability makes it useless to have such a law…Focus on the value of having a law in place that gives cyclists the power of law to educate motorists on the safest way to pass a cyclist from the rear–at least 3 feet please. Make it happen California…too much is at stake. After having passed the State Senate earlier this year, the bill now awaits Governor Jerry Brown’s signature.